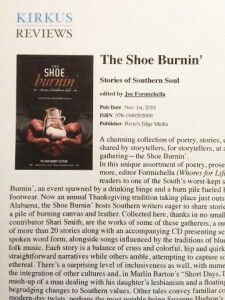 NEWS FLASH: The Shoe Burnin’: Stories of Southern Soul, received a terrific review at Kirkus on Monday! You can read it here. Everyone involved with the anthology—the editor and contributors and publishers—are thrilled. Why? If you’re not aware of what Kirkus is, here’s a little history. What did they say about TSB? Each story is a balance of crass and colorful, hip and quirky, some featuring straightforward narratives while others amble, attempting to capture something more ethereal. A charming assortment that, for some readers, could retune the meaning of Southern. 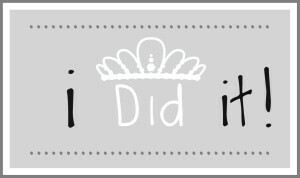 Last Thursday I hit another milestone: I finished revisions of my novel, Cherry Bomb! It’s been over a year since I quit working on them (following my wreck) and when I’ve tried to get back to work over the past few months, the prospect has overwhelmed me. But for some reason, last Thursday I got the manuscript and the editor’s overview back out and dug my heels in. Within a few hours (yes) I was finished and had emailed it to the agent who has shown interest. 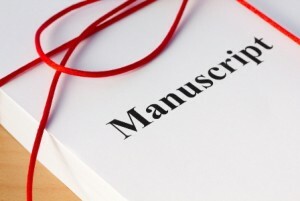 (Agent’s name) has asked me to send you her best regards and to thank you for sending your revised novel, which we have just received and we are very much looking forward to reading! My hope is she will like the revisions enough to represent me and maybe there will be a book deal in my future. I’ve been celebrating this milestone a little bit every day, while turning my new energies to planning a few special events and picking back up another novel I started in May, which the faculty at the YOK Shop in Oxford said had promise. I have no idea how long I’ll have to wait to hear back from her, but I’m not gonna’ sit around worrying about it. Much. Just reading this – Many congrats on finishing!! So exciting!! Thanks, Karissa. Although I’m sure I’ll be doing more revisions, it feels great to at least finish “this round.” I’m on pins and needles waiting to hear back from the agent!